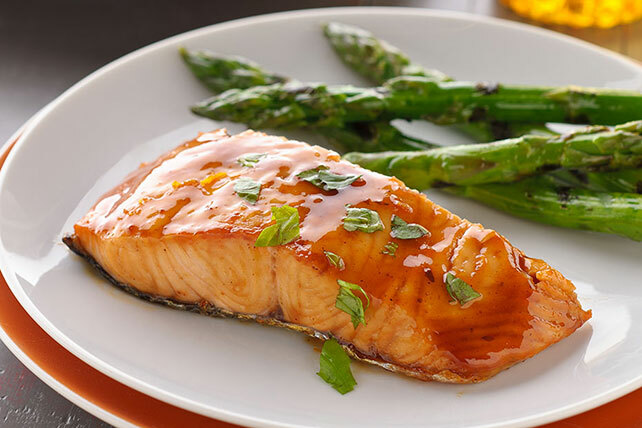 The secret ingredient in this scrumptious, quick grilled salmon dish? Maple syrup. Grill now, thank us later. Mix first 3 ingredients until blended. Reserve half the sauce for later use. Place fish, skin side down, on grill grate; brush with remaining sauce. Grill 10 min. or until fish flakes easily with fork, brushing with reserved sauce after 5 min. Immerse 1 untreated cedar plank (14x7x1-inch) in water, placing a weight on top of plank to keep it submerged. Soak 4 hours or overnight. Heat grill as directed. Brush top of plank with oil; top with fish. Place on grill grate; grill 10 min. Meanwhile, prepare sauce as directed; reserve half for later use. Brush fish with remaining sauce; grill 5 to 10 min. or until fish flakes easily with fork, brushing with reserved sauce after 5 min. Remove from grill; sprinkle with basil.